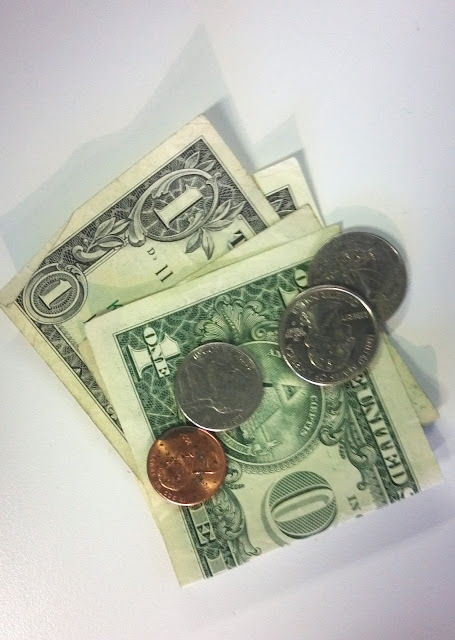 Funny story to go with today's theme... and no, it's not funny that this is all the money I have in my purse. That would be $2.65. I had more, but I bought two more boxes of Girl Scout cookies. I love Girl Scout cookies. It's a real problem. And now I have $2.05 because I also love Coke. Brian & I (and our team leader, Michael) went to a lunch meeting today, and as we were getting in the car to leave, Michael saw what-looked-to-be a bill fly by. We started to pull away, and passed the bill flying in the wind, to which Michael slams on the brakes, and Brian jumps out of the car to retrieve what turns out to be just a dollar. At that moment, I looked in my bag, and realized that 3 of the 4 dollars that I did have in the front pocket of my purse were missing. Thereby determining that the "found" dollar was really a lost dollar, and there are 2 more out there somewhere! Dangit! We drove back through the parking lot, to see if we could find the other 2, with no luck. I have no idea how they flew out of my purse, but Brian was at least nice enough to give the 1 back to me! Such a sweet husband. And by the way, after our feature on Better After, we've had over 1700 page views (in the last 24 hours)! And so far, only positive comments! Woohoo... I don't think I could take much more negativity!